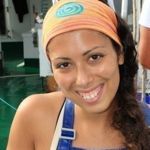 I am Vanda Carmo, a MAR-ECO student from the University of the Azores in partnership with the Institute of Marine Research (Norway) and VIMS. I am on board the RV Bigelow together with my supervisor Tracey Sutton and a group of scientists and students from several countries. On this cruise I am especially interested in the diets of mid-water fishes called Stomiiformes. This is a diverse group that includes dragonfishes, lightfishes, marine hatchetfishes, viperfishes, and loosejaws. To study the feeding habits of these fishes, one has to first get acquainted with their prey, since in the stomachs what you usually get are parts and bits of the original prey items, making identification a lot more difficult. I am thus gaining experience identifying the potential prey of my fish targets. These fish feed mainly on small crustaceans, including zooplankton (copepods, euphausiids, amphipods, ostracods) and micronekton (decapods), but some also eat other fishes. We suspect that they might eat jellyfish as well. We are using mid-water and bottom trawls supported by hydroaccoustic methods. The pelagic net has 5 cod-ends and is equipped with an opening and closure system, allowing us to capture organisms from discrete depths in the water column, while the bottom trawl is a larger net that can capture larger organisms as well. We started with the pelagic trawls and left the bottom trawls for the end since the bottom topography is very irregular and as consequence the gear may get stuck, ripped, or even lost. Our deepest tow so far was down to 2,900m (8,700 feet). When the trawl net comes up the scientific crew gathers on the deck to retrieve the samples from the net. Once in the wet lab the sorting process starts, after our professional photographer David Shale chooses the best-looking specimens for pictures. Tammy Frank and I track the crustaceans, Tracey Sutton and Zack Baldwin usually go for fish, while Bastian Bentlage sorts the jellyfish. We also keep mollusks for Mike Vecchione. When the rough sorting is finished we begin fine sorting to the lowest taxonomical level possible. This depends on the time required to process a sample so in some cases (especially for the crustaceans) we keep the identification to the family level. We identify fish to species level and in some cases even take individual length and weight using a motion-compensating scale. Meredith Cavanagh and Zack Baldwin enter these data in a computer program together with the counts and weights for crustaceans, allowing us to print labels for every sample taken. After this process the samples are preserved either in formalin or kept frozen for further studies (e.g., diet or genetic studies, stable isotope analysis, etc.). For the bottom trawling we also have special requests for otoliths (ear bones), gonads, and stomachs. In both cases we also extract tissue samples for DNA studies. From what we have seen so far, and as expected for this latitude, we are getting low diversity and high abundance of micronekton, but as in the 2004 MAR-ECO cruise aboard the G. O. Sars, one peculiarity seems to persist—we are getting deep-water animals in surface tows. This may indicate that the Charlie Gibbs Fracture Zone has some special features yet to clarify.